Virtually all of InMotion Hosting competitors utilize a single data center. This means your website and email could be 3,000 miles or more away from you. It is cheaper for them, but just doesn't make sense for you. With InMotion Hosting you can choose your data center location. Even better, if you are within our Exclusive Max Speed Zones, your email and website can run up to 6x faster. The idea is very simple. Multiple data centers means faster connections to your location. Look for the image to the left of this text on InMotion's website and check the coverage map to see which location is best for you. 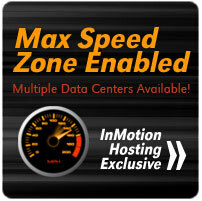 Max Speed Zone options available to InMotion VPS hosting and InMotion Business Class hosting clients only. Individual speeds will vary due to your personal internet connection (ISP). To confirm performance, InMotion tests from 35 locations in the US and another 46 locations around the world. Further testing can be done via InMotion's website to confirm the fastest datacenter for you.